When Singapore's former Prime Minister Lee Kuan Yew visited Washington recently, he spoke at an awards ceremony sponsored by the US-Asean Business Council and attended by U.S. President Barack Obama. The gist of his message was that Asian countries see American involvement as vital to balancing Chinese influence. With Obama taking time out from a knife-edge domestic debate on healthcare reform, it remains to be seen what comes from his 10-day Asian tour on which he will visit Japan, Singapore, China and South Korea. U.S.-China relations and a variety of spin-off issues from the global economic turmoil will likely dominate headlines over the coming days. With China acting as an engine for global economic recovery, the world awaits a return to dynamism in the United States. "It's amazing what China's good fortune has done for the world," said William Overholt, from Harvard University's Kennedy School of Government. "In refloating the world economy, there are only two countries that can allocate resources on a scale to get the global economy going again—the U.S. and China." Exclude China, and this year's growth forecast for developing Asia drops from 6.7 percent to 1.1 percent, the World Bank said in its most recent regional update. It warned, moreover, that a sustained recovery is still far from certain, as Asia remains dependent on exports to the United States and Europe in the immediate term. "Asia cannot boom if the West is not booming," Standard Chartered Bank Chief Economist Gerard Lyons wrote in a report last week. "The trouble in Asia is still its export dependency." The United States and Japan will prioritize security and defense issues, with consternation in Washington that Tokyo will seek the relocation of U.S. bases from its territory, and broader concerns about the still-hazy foreign policy plans of the Hatoyama administration. Either side of the Singapore meetings, Obama will discuss topics such as climate change, nuclear proliferation, North Korea, Iran and Afghanistan with the three East Asian leaders. For Burma and the nine other member-states of Asean (the Association for Southeast Asian Nations), the highlight of the president's visit will be the first-ever U.S.-Asean summit, scheduled for November 15. Obama will first seek to reassure that the United States will not leave Asean to deal with China without support from Washington. While the Bush administration chalked up some success with its China and India policies, according to Singaporean academic Kishore Mahbubani, it was perceived as neglectful of Southeast Asia. The region includes long-time allies such as Thailand and the Philippines, but the image emerged of a U.S. that did not care much for the region beyond counterterrorism operations and concerns over continued military rule in Burma. Singapore might beg to differ, however, given that the Bush administration signed a free-trade deal with the city-state in 2007, increasing exports from the United States to Singapore by 73 percent. On Tuesday, Singapore broached the issue with an ambitious call for an Asia-Pacific free trade zone that would comprise about half of global trade. Any backsliding on trade liberalization would be disastrous for a world economy still emerging from economic crisis, said George Yeo, Singapore's foreign minister. But although Asean has signed trade agreements with China and India, it seems unlikely that Obama will push for US equivalents, given the hostility of some Democrats to anything that could upset Stateside labor unions at a time when U.S. unemployment is at a 26-year high. However, Obama may get the ball rolling on this, at least in private. "There is nothing more important to Asean than free trade," according to Walter Lohman of the Heritage Foundation in Washington, who added that Obama should at least indicate an interest moving forward a U.S.-Asean Free Trade Agreement. After senior U.S. State Department officials visited military-ruled Burma last week, there is much anticipation around the weight the U.S. president will give to reform in Burma during his 90-minute Asean meeting. He is expected to restate long-standing U.S. requests that Aung San Suu Kyi and other political prisoners be freed, and that the junta initiates a national dialogue with all ethnic groups and the opposition parties. Speaking early on Wednesday in Singapore, U.S. Secretary of State Hillary Clinton said the United States will not impose conditions on the Burmese regime to force democratic changes there. But she also said that existing sanctions will remain in place until the junta makes "meaningful progress" toward democracy in key areas. President Obama's voice on this matter will carry much more weight than any official, with a decisive statement in favor of reform, pushing Burma's Asean counterparts to shoulder some of the responsibility. This could help dispel what Kraisak Choonhavan, a Thai Democrat MP and head of the Asean Inter-Parliamentary Myanmar Caucus, described as "confusion over the new U.S. Burma policy," meaning that there was a perception that Asean's engagement was being vindicated retrospectively by the U.S. decision to talk to the junta, and by Obama's "reaching out" to states such as Iran, Sudan and North Korea. No doubt China will be closely monitoring the U.S.-Asean summit, after making decisive economic and political inroads into Southeast Asia in recent years. A pre-summit visit by Chinese President Hu Jintao to Malaysia will cement a recent addition, with China's largest bank getting a foothold in the recently opened Malaysian banking sector. But China has not been shy throwing its weight around in the region, and when speaking in Washington last week, former Singapore Premier Lee raised concerns about Beijing's military build-up, saying that this has clear implications beyond Taiwan. Lee made direct mention of Chinese claims to the South China Sea and to islands in the region, which have stirred tensions with a number of Southeast Asian states in recent years. 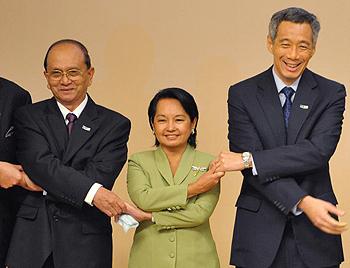 The U.S.-Asean summit will take place on the sidelines of a broader meeting bringing together leaders from the Asia-Pacific Economic Community (APEC), an amorphous and often derided forum that was the brainchild of the Australian government, originally set out to advance trade and economic cooperation across 21 countries, from Chile to Canada to Papua New Guinea to South Korea. APEC's 2.7 billion people account for more than half of the world's GDP. Now, the grouping is struggling for relevance and for a mission, as numerous bilateral trade deals are made and discussed. Moreover, with China, Japan and Australia all floating ideas for pan-Pacific communities of varying scope and intensity, it remains to be seen whether APEC has a future. The G-20 grouping, which brings together countries generating over 80 percent of the world's economic output, has recently taken center stage in trying to shape economic recovery. It might seem to some that APEC's days are numbered. Or maybe not. Writing on the East Asia Forum, Peter Drysdale and Shiro Armstrong noted that "the APEC mode of international policy cooperation is that around which the G20 has been put in place to deal with the global financial crisis and a host of global issues down the track." If so, the forum could still serve as a useful get-together for regional leaders, with calls for India, another nascent Asian giant, to be included. This article was originally published by The Irrawaddy: http://irrawaddy.org/.